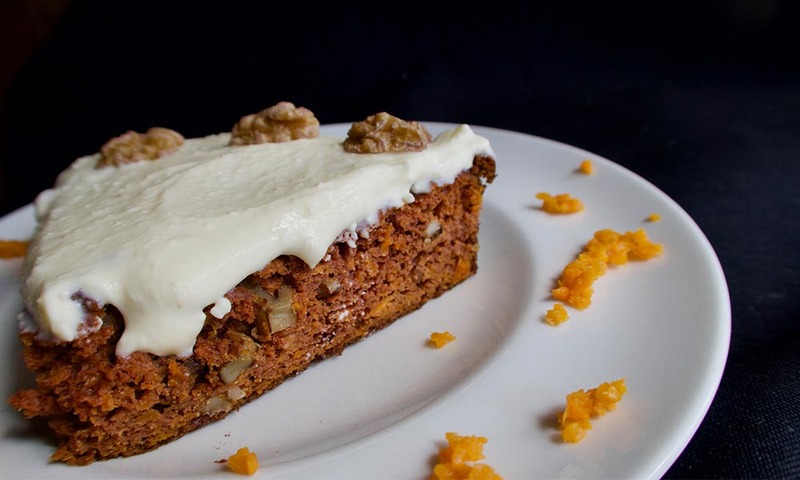 This Ketogenic Carrot Cake has a special place in our family recipe collection. I’ve tested this recipe many times…and then a few more times just to make sure it is still as good as it was the first 10 times. I love the ease and simplicity of this recipe. 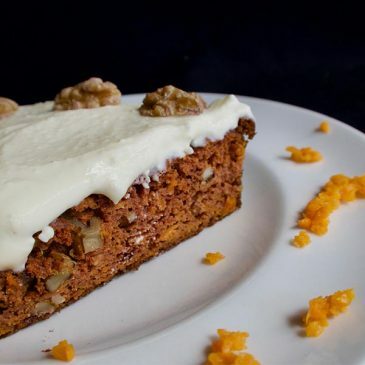 You can make a moist, low-carb, ketogenic carrot cake without fancy ingredients or equipment. That’s just the way we roll, simplicity is key. I created The Ultimate Guide to Low-Carb Baking during the first year of our baby boy’s life. Most of the time, I was babywearing him as he slept on me in a baby backpack. The majority of the recipes are a deliciously epic result of mixing a dry bowl and a wet bowl together and popping it in the oven. 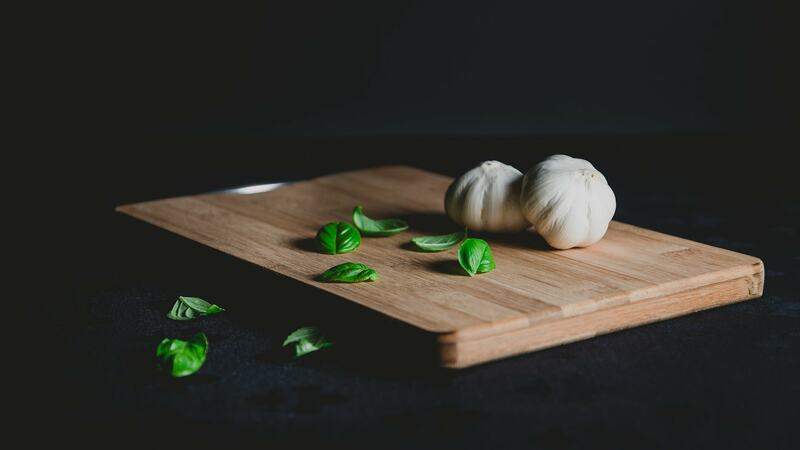 I like the challenge of keeping recipes basic but interesting by making up new flavor combinations and suggesting ways to make variations on the original recipe. A personal goal of mine is to always be working to demonstrate the variability and versatility of low-carb and ketogenic cooking or in this case, baking. Working with a baby on my hip also inspires simple, practical food prep! A 5 ingredient cream cheese frosting gives a creamy texture to the moist, nutty cake. Wait until the cake is cooled before spreading your delicious cream cheese frosting so it doesn’t melt and run down the sides. 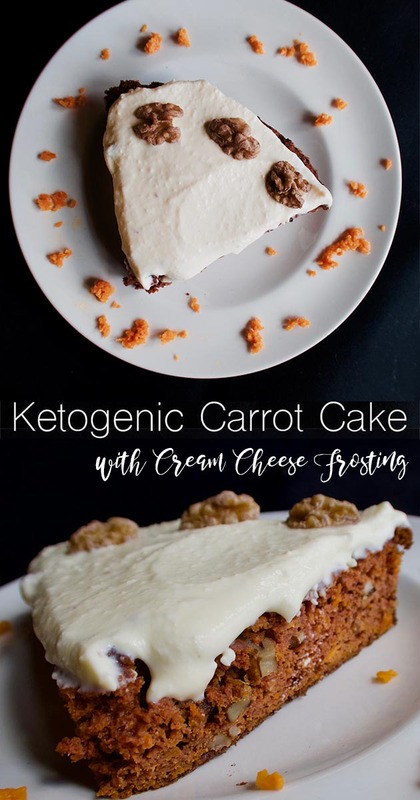 There are two ways to go about frosting a ketogenic carrot cake. Choose between frosting the whole cake, then slice and serve or slice into individual pieces, frost and then serve. Usually, I end up frosting individual pieces just before serving. 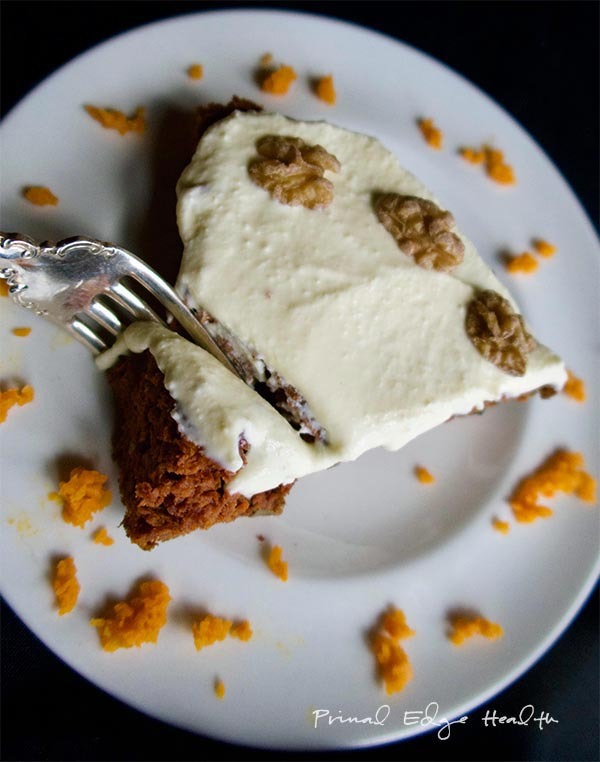 The ketogenic carrot cake is super tasty warm, room temperature, or chilled. Anyway, you can’t go wrong. This recipe doubles easily. Make a double layer ketogenic carrot cake and “glue” it together with frosting. Frost one of the “butts” of the cake (the flat bottom part), put the second cake on top and frost the entire top and all over the sides. If you’re into MAPLE flavor, I have a tip for you. Add a splash of Lakanto’s Maple Flavored Syrup to the frosting and mix it up well. No frosting. Don’t think for a moment you miss out on any pleasure or mouth feel. If you watch the video below, you’ll learn that after trying pieces side by side, Tristan and I agree that the carrot cake is just as good without the frosting! Is it better? I can’t say… you decide. Want to skip the walnuts? If you have nut allergies, simply omit the walnuts and keep the carrot cake nut-free. If your pantry happens to be empty of walnuts, you can substitute pecans or hazelnuts instead. For those interested in advanced food prep, try soaking and drying the nuts before baking with them. Soaking nuts and large seeds in water for a few hours incites the germination process of the nut/seed. They swell up to at least twice their size, depending on what the item is. Material can be dried in a single layer in a food dehydrator or at a low temperature in the oven. Complete directions of fully detailed in both my cookbooks, The Ketogenic Edge Cookbook and The Ultimate Guide to Low-Carb Baking. I included a section in both books because both Tristan and I prefer the sprouted nuts to raw or toasted nuts and we have been doing this practice for years. There are a few benefits we really enjoy, most notably, the resulting dry nut is extra crispy and has a great mouthfeel. We think the flavor is enhanced and more robust. Many people discuss the increased bio-availability of soaked nuts as well. It adds an extra step to complete before they are ready to use, but I am in the habit now of soaking the nuts and seeds (like pumpkin and sunflower) as soon as I bring them home from the market. Usually I soak overnight and dry them the following day, then store in an airtight container so they are on hand, ready to be used. It may take a few turns to get in the rhythm of doing this, but once you try it and see the difference, I think you will agree, the result is worth the effort! 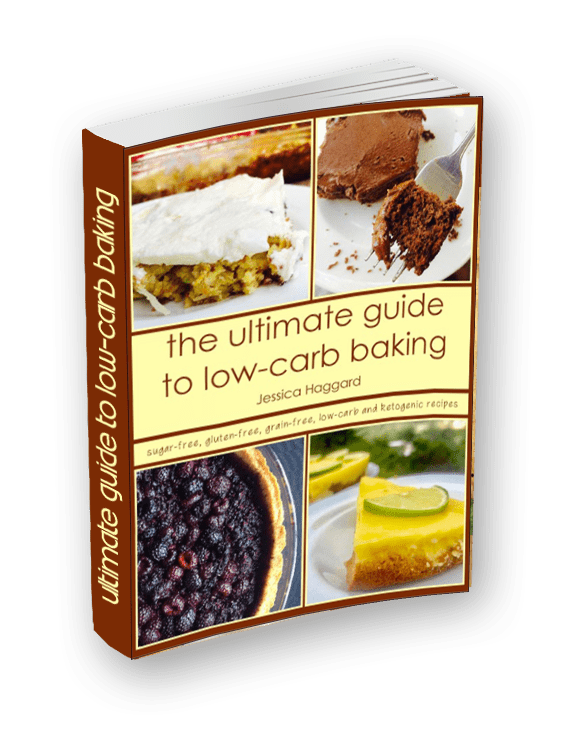 Learn how to successfully bake on a low-carb and ketogenic diet! Enjoy all the classic flavors of carrot cake and enjoy this super easy recipe with the whole family. Combine carrots, eggs, and coconut oil in the bowl of a food processor. In a medium bowl, mix all the dry ingredients. Reserve the nuts. Stir the contents into the food processor and blend to combine. Fold or pulse the walnuts a few times to mix evenly. Bake in a greased 8 by 8-inch glass baking dish for 25 minutes, until edges are golden brown and the center is set. While the cake is baking, prepare the frosting. Add cream cheese and butter or coconut oil to a medium bowl and mix until thoroughly combined. Mix in Lakanto. Set aside until the cake has cooled. Remove the cake from the oven and cool before frosting. Slice and frost individual pieces or frost the whole cake before dividing into portions. Serve warm, chilled, or at room temperature. Macros per Serving: 13 g fat, 3.9 g carb, 2.2 g net carb, 3.5 g protein *macros are for the cake only. Note: Add a splash of Lakanto's Maple Flavored Syrup to the frosting and mix it up well to make a ultra creamy MAPLE frosting! Coupon code "primaledgehealth" = 20% off. If you shop online, use this link to purchase high-quality butter from US Wellness Meats and we will be grateful and receive a small commission. This is sooooo amazing. I made it for my bday as I was craving it. Making it again today! Speaking of kid friendly, would the cake work in a mold? I have a super cute silicone bunny mold I want to try for Easter. I would think so! Don’t see why not. I know a lot of people that are making it for Easter. Let me know how it comes out! Just to let you know. The recipe here is slightly different from the one in the book. You have two tablespoons of cinnamon here and two teaspoons in the book. Oh wow – hahah, I’ll fix that, thank you 😉 Did you try with 2 tablespoons? That’s quite a difference! Now i’ll have to try it out to compare. Good think Aryana asks for this cake all the time! I’m just looking at your carrot cake recipe and and it looks delicious, but I’m trying to see how it works out to be only 2.2 grams net of carbs. The Lakanto sweetener by itself is 4 grams of carbs per teaspoon and 1/4 cup equates to 12 teaspoons. But apparently, because it’s sugar alcohol, one is supposed to reduce the carb count by half. So each serving of cake has 2 grams of carbs from the sweetener. The 2 cups of carrots have 21 grams carbs, of which 25% is fibre, so 15.75 grams net divide by 12 pieces = 1.3 grams per piece. So now we’re at 3.3 grams net carbs per piece. The coconut flour has 8 grams net for 1/4 cup. That brings it up to 4 grams carbs per slice of cake. Another 4 grams net carbs for the walnuts. So that’s now 4.3 grams per slice. 16 grams carbs in the cream cheese, so now it’s 5.6 grams carbs per slice. And the 2 teaspoons of sweetener in the icing brings the grand total to just over 6 grams carbs per serving. I’ll still make the cake, and I’m curious to check out your other recipes. But I’d really like to know why my carb calculation is different from yours. The carbs from Lakanto are non-digestible and do not count toward “net carbs”. The macros per serving are for the cake only, frosting macros would be calculated separately. I use spark recipes to calculate macros, perhaps there is some variation in their numbers than the source you are using. Thanks, Jessica. I should have investigated the Lakanto closer. Good to know it’s zero net carbs. been looking for a great cheesecake recipe and was hoping that you had one in your book but I didn’t see it. Secondly, I can’t use beef gelatin, is it absolutely necessary and are there substitutions? There is a Lemon Cheesecake Bar and Boysenberry Bar in the Sweet Treats and Bars section, make these in a spring form pan and you’ll have cheesecake. I don’t know if any sub for beef gelatin. Great tip! I’ve never used it before. Do you recommend a 1:1 ratio to replace the gelatin? Hi there, Am I missing something? Most [similar] recipes that I have been looking at have at least 2 cups of almond flour + 1/4 cup of coconut flour (and 4 eggs, 1/4 cup oil, etc…). Of course, that is in a 9×13″ pan instead of a 9×9. Just a 1/4 cup of coconut flour seems like almost nothing. I mean the spices alone are 1/4 the amount of the flour…. If you want to fill a 9×13 inch dish, double the amount of ingredients. You’re not missing anything, this is the recipe. Hope you enjoy it!